Shade, the Changing Girl #1 Review – AiPT! Megan appears to be your typical, bitchy, Earth dwelling teenager. She is the queen bee of her group–or at least she was. You get the sense that no one has really been missing her since she has been in a coma. When the hospital calls to tell you your daughter has just woken from a five month coma, the expected reaction is for you to thank some deity and cry for joy, not seem annoyed. Megan must have been one hell of a handful when she was alive. Her parents claim their lives “will not be held hostage again” and then there are her friends who are scrambling to get stories straight before they see her. Loma inhabits the planet Meta. She is enamored with the alien poet Rac Shade who wore a madness vest to travel to Earth, also known as the blue planet. Loma is a free-spirited party girl. She owes “bad people” money and keeps multiple lovers. Loma wants to experience the “big feelings” of Earth. Loma wants an escape. Dawning the Technicolor dreamcoat of insanity, Loma slips away and into Megan. Shade, the Changing Girl by Cecil Castellucci is inventive. I quite like the idea of insanity as a vehicle; a means of transporting one’s consciousness into another being in a completely different galaxy. Trying on another life and another world temporarily. Apparently, on the planet Meta, they have advanced far beyond the mind-expanding acid tests of the sixties. What tests were they conducting with this madness vest? Why conduct them on Earth? Why is it that only one Earthling can see Loma’s insanity aura? These are questions I would like to see explored in future issues. The art aligns with psychedelic nature of the story. There is no shortage of circles, orbs and wavy lines to evoke the psychosis of Loma. Marley Zarcone does a fantastic job of depicting two distinct worlds. Subtle elements or textures are repeated in each world that provide an artistic cohesion flowing from one realm to the other. Did I like it? Yes. There are three stories taking place at once: Loma’s insanity, the shadows of Megan’s memories of what happened to her and the combining of these two beings as one. 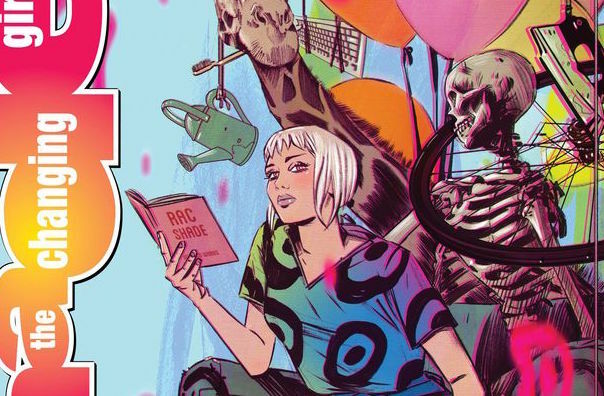 Shade, the Changing Girl #1 is a trippy read that is sure to please. My Fears? It will be interesting to see where the story leads us as one mind takes control of another. I just hope that Castellucci does not lead us in the direction of the CW.